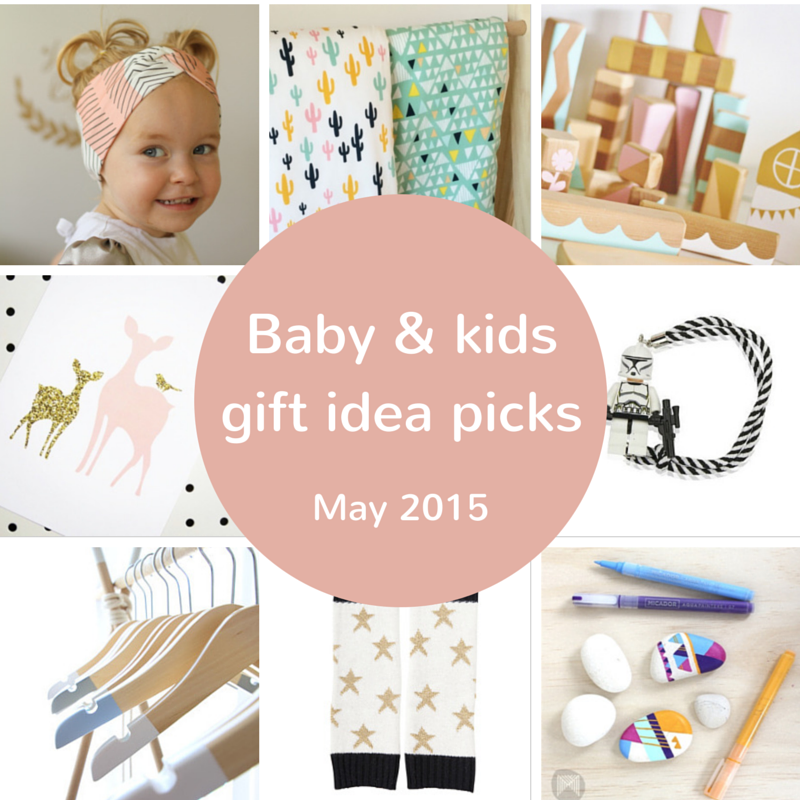 Here are 11 of my favourite baby and kids gift idea picks spotted on the interwebs this month. 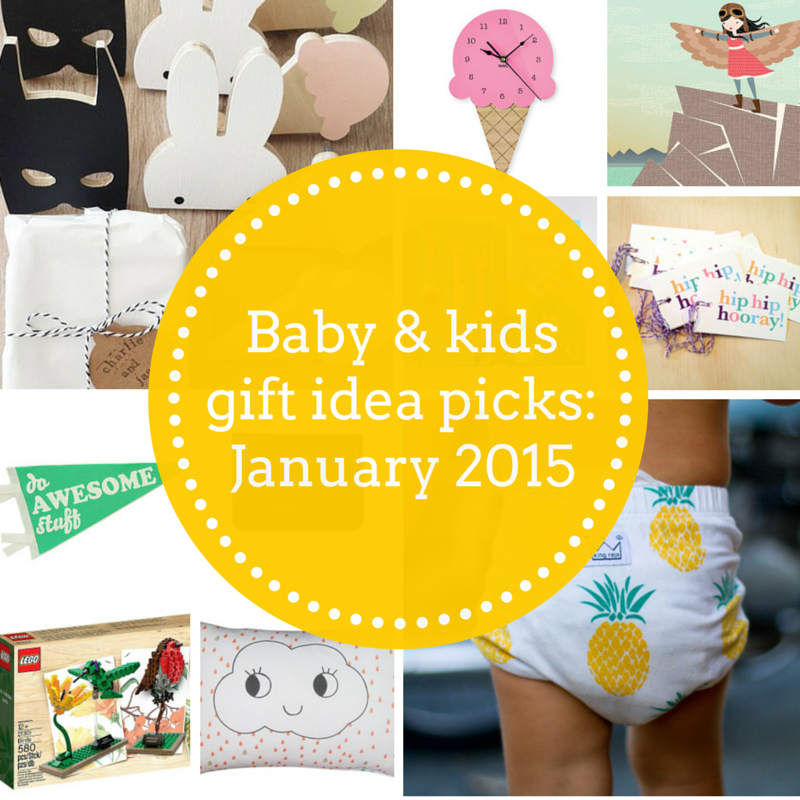 Nothing is sponsored here – these gift ideas are ones I love (or would love to give)! 1. This outfit is so pretty! 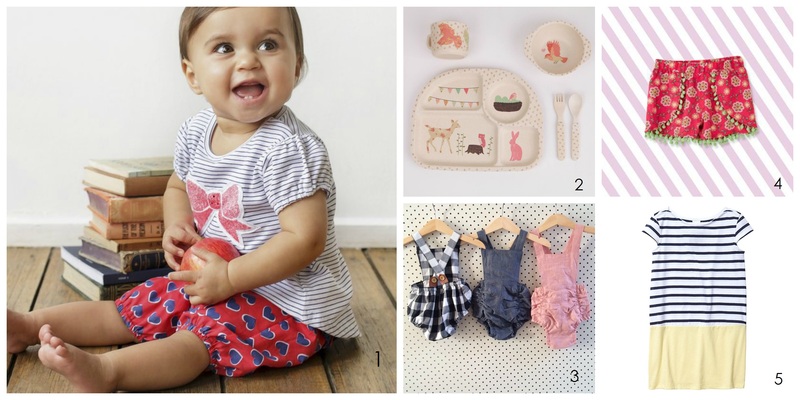 Fox & Finch Baby ‘Mon Petite Coeur’ Striped Bow Applique Tee teamed with Fox & Finch Baby ‘Mon Petite Coeur’ Heart Print Comfy Short in sizes 3 mths up to 24 mths. Available from Billy Lids. 2. Beautiful bamboo Love Mae dinner sets coming soon to Archie & Evie. 3. Sweet new summer rompers from Hubble and Duke handmade in Western Australia in sizes 0-6 mths and 1 through to 5 – due to land very soon! 4. This Pumpkin Patch girls floral skort (in sizes 5 – 12) is perfect for summer – love the green pom poms. 5. I bought this Target Girls’ Nautical Daisy Striped Dress in Blue Lemonade for Miss TT. A cute and versatile dress at $10! 6. Kids teepees make great play areas and I love the bright turquoise colour of this KidKraft one. Available at Lime Tree Kids. 7. Loving the under the sea theme of the Camelbak spill proof kids sized Eddy Water Bottle. Available from Urban Baby. 8. Ninja Pencils! Be afraid not of the pencil, but the one who wields it…..spotted on Cool Mom Picks. 9. This Country Road tropical overnight bag will get kids ready for summer holidays and sleepovers. 10. Tins like these are fantastic for storing little treasures or craft items (Miss TT uses hers for stamps). I love the retro feel of the Blafre Lotta Loves Bike Tin Suitcase from Down That Little Lane. 11. Night Vision Goggles from Discovery Kids – night vision goggles!!! If only Miss TT and Mr TT were older (although Handy Hubby is a big kid). These are for ages 8+ and available from No i Deer Gifts.